Based on reviews from 16,632 users. Learn how our rankings work or see our guide to Adidas NMD sneakers. Updated Apr 2019. Unveiled in December 2015, Adidas NMD sneakers can be considered as the new kids on the block. But the collection's success and popularity so far have shown nothing near being a neophyte. Launched under the brand's Originals wing, this footwear collective boasts of Adidas' expertise in innovation in both the field of technology and design. What started from a single shoe release grew into a selection of various types of Adidas NMD sneakers that are now regarded as one of the company's star-players. If you're a fan of Adidas NMD sneakers and trying to pick up a piece of modern sneaker history or if you're merely intrigued and curious as to what the fuss is all about we advise that you read on to discover and learn all about the ins and outs of the NMD sneaker fever that's been sweeping the sneaker world. Despite the glaring similarities between NMD models, each sneaker type features unique strong points and offers different advantages to consumers who value different shoe characteristics. Some may prioritize more support over a breathable fit while others may choose an NMD pair with a laceless construction over the traditional use of shoelaces. Below are the base NMD models and their main strengths and differences to acquaint you of each shoe's general features. Similarity-wise, these two NMD shoes are crafted from knit uppers with a lace-up system and recognizable silhouette. They also both display the iconic Three Stripes on the side, a heel pull-tab, and a solid heel counter for added reinforcements. The two models also offer superb cushioning, comfort, and a breathable fit. However, the NMD_R1 features more reinforcements and design elements with its leather eyelets, triple lego-like midsole plugs, and heat-pressed toebox reinforcement. Without compromising comfort and function, the update presents a simpler and more minimal aesthetic in the NMD R2 by utilizing just one midsole plug on the shoe's medial side and losing the leather eyelet and heated leather reinforcement in the toebox. Additionally, the "R" in these Adidas NMD sneakers' official names means runner. The NMD_C2 and C1 models are the "chukka types" of the Adidas NMD sneakers collection. Sturdier materials such as suede, leather, or canvas usually make up its uppers, and a lacing system with just two or three pairs of eyelets characterize these shoes. The similarities between the two stops there as each sneaker display an entirely different style from the other. The Adidas NMD_C1 displays a mid-top profile with the original three lego-like plugs present in the midsole. It also features a contrasting leather heel panel for added durability. On the other hand, the NMD_C2 is a low-top with a more straightforward and more unadorned design with just the medial midsole plug, heel tab, and perforation detailing as its design details. And yes, if it hasn’t been too obvious, the “C” stands for chukka. The "CS" in these shoes' official names means City Sock, and from this given meaning these models' constructions are essentially self-explanatory. These Adidas NMD sneakers boast of uppers modeled after socks utilizing the brand's Primeknit technology for more support and durability to take on the demands of everyday casual wear. Both function as a slip-on and features heel pull-tabs for aid in easier entry. The futuristic NMD CS1 displays a minimal upper accented by the signature NMD midsole plugs. It is also characterized by multi-directional line patterns that elevate the kick's design. The NMD_CS2, on the other hand, features a simpler look by letting go of the midsole plugs and instead employs an overlapping design detail on the medial side as the shoe's design highlight. Now that you're familiar with each model's general characteristics here are some of the most popular and well-received NMD releases. This part included colorway and material iterations that did well in sales and created a buzz in the sneaker world. The original Adidas NMD_R1 is probably the most well-known "General Release" in the NMD range by far, so it is not unexpected for a Primeknit version to follow in its footsteps when it comes to popularity. Dubbed as the Adidas NMD_R1 Primeknit, this version featured the brand's Primeknit technology for its upper and retained the rest of its predecessor's design. With today's trend obsession towards breathable and lightweight uppers, this Primeknit upgrade was inevitable. It is offered in various colorway options. Some are listed below. This iteration is the same as the above shoe model but differs in aesthetic design. The Adidas NMD_R1 STLT Primeknit’s selling point is its striking stripe-like upper design bathed in contrasting colors. The STLT stands for Stealth. Check this kick in the colorways listed below. This shoe looks almost identical to the NMD_R1 as it inspired it, but the addition of a premium midfoot leather cage provides an entirely different look and feel. The leather cage offered more support and stability to the shoe and an enhanced edgier NMD XR1 look. Here are some of the shoe's colorways you can check. Building on the success of its predecessor, the NMD XR1 Primeknit upgrade boasts a look that's almost synonymous to a surefire hit among consumers. It replaces the original's mesh upper with engineered Primeknit material for durable elasticity, enhanced support, and maximum breathability. The sneaker is available in a wide array of colorway options. Some are listed below. Just like the Adidas NMD_R1 Primeknit, this sneaker’s distinction from its parent model is that it utilizes Adidas’ Primeknit upper technology instead of mesh for enhanced durability and support. These Adidas NMD sneakers have an outdoorsy style that embodies its name. With a mid-top construction combined with chunky, ribbed outsole it blends the ruggedness of the trail with contemporary running style. Its nylon upper is reinforced with leather overlays for added durability and support. Although its name suggests that it could be used for outdoor activities, the Adidas NMD_C1 Trail is a lifestyle sneaker created for everyday use. This pair is a waterproof version of its parent model and remains faithful to it by keeping the original's silhouette, materials, and construction. This shoe is an all-weather version of its predecessor. Thanks to its Gore-Tex finishing, consumers are presented with a pair that's ready to take on wet and cold seasons. The shoe is available in two neutral colorways: black and white. Sizing guide: Are Adidas NMD sneakers true to size? Shopping online is understandably discouraging to some because of horrific stories and regretful reviews we've seen and read in the interwebs. Most consumers' worries and hesitations stem from concerns with footwear sizing. For that reason, we've gathered information regarding the sizing of Adidas NMD sneakers to assist footwear fans and first-time online purchasers in making the best decision to get the bang for their hard-earned buck. This part offers a general sizing guide on NMD sneakers. Please be informed that each model or release may have a different fit and feel when compared to previous models. Moreover, it would also be helpful if we bear in mind that each foot's shape, needs, and size varies from individual to individual. Based on Adidas' official site the brand uses standard U.S. sneaker sizes in determining adult sizes. Their size chart shows a difference of one size between men and women's sizes, with the guys' sizes being higher. According to sneakerheads, the different variations and releases of Adidas NMD sneakers all fit different and is known in the scene to cause a bit of a headache when it comes to sizing. Below is a list of some NMD sneakers grouped according to the consensus of sneaker reviews. Arguably one of the most famous partnerships that Adidas NMD sneakers ever did, this release was huge and influential that it broke the internet when it was first announced and is still causing mayhem among sneakerheads who haven't had the chance to cop a pair. It is a limited edition sneaker collaboration between Japanese streetwear giant A Bathing Ape and Adidas Originals. Most of their collaborative sneakers have done well in the past. Dressed in a soft, neoprene-like mesh upper with allover BAPE signature camo print and Adidas' Three-Stripe branding on the sidewall, this pair is one of the rarest Adidas NMD sneakers released by far. Fun fact: this is the only sneaker in this list that doesn't have a Primeknit upper. It was released in two colorways and retailed for $150. Although Adidas has re-stocked in the past, pairs still ran out like pancakes, and the only option for buying is through resellers. Though be warned that reselling prices of this model is unbelievable as sales start at $725 and have reached as high as $4,065. Unlike the BAPE collaboration, the partnership between artist/producer Pharrell Williams and Adidas Originals is ongoing. The first pair donned a yellow and black color and debuted in 2016 for $240. Since then endless colors and iterations have been released that it is quite challenging to stay up to date. But so far aside from different colorways we've also seen Adidas NMD sneakers that featured various texts on its upper, from Human Race to Special, Being, Man, Hu, Breathe, Walk, and Clouds. The most recent buzz in the sneaker scene have reports saying that a new set of Adidas NMD sneakers in collaboration with Pharrell will be releasing on August 2018. The collective of shoes will be called Pharrell Williams x Adidas NMD Hu "Solar Pack." It is said to include three Adidas NMD sneakers that boast bright colorways bathed in tribal patterns and prints. So far sneaker fans think that it is an ode to Africa as texts on the shoe's upper reads "MIL3L3," "MOTH3R LAND," and "3MPOW3R." Moreover, news of a third NERD colorway is also making rounds on the Internet. This collaborative pair is one of the most coveted NMD sneakers of all time. It chose the NMD_R1 Primeknit silhouette and bathed in a black and red tie-dye print. The shoe was released exclusively at various Adidas Consortium retailers to celebrate the company's Consortium World Tour series in 2016. This particular design is an ode to the city of San Francisco and the hippie trend that took over the city during the 60s and 70s. Although it had been introduced a couple of years ago and stocks are incredibly hard to find today, sneakerheads are still searching to cop a pair of their own. However, Nice Kicks have decided to restock during the start of 2018, so maybe there will be another chance for fans to cop again in the future, just make sure to keep up to date. Japanese brand NEIGHBORHOOD has been a long-time collaborator of the Three Stripe brand. They have done iterations for the Stan Smith and Superstar models, but the Adidas NEIGHBORHOOD NMD_R1_PK is their latest project together. The sneaker displays an eye-catching design thanks to its high-contrast hits of white in the form of stitching, branding, and shark tooth motif. It was released on February 2018 for $200. Recently, scoring a pair in its original price proved to be quite tricky however aftermarkets have some sizes left but with its cost doubled. Reselling prices were reported to start from $290 up to $560. What is the average cost of Adidas NMD sneakers? It is a prevailing opinion among sneaker enthusiasts to say that Adidas NMD sneakers are on the slightly expensive scope of the sneaker price chart. However, the same people would also be quick to justify that the prices of these models are reasonable due to its optimal comfort, trendy style, limited nature, and premium quality. As an estimate, Adidas NMD sneakers that are released as GR (General Release) are priced within the range of $120 to $180, whereas collaborative NMD sneakers are priced even higher, with some reaching a four-digit retail price somewhere between $1,160 to $2,000. Now, if you found this given four-digit retail price astounding, then you better stay away from the reselling market because prices were reported to soar up to a whopping $10,000+. On top of being super famous, these collaborative shoes are released in ultra-limited pairs making the value climb even higher and leaving consumers yearning even more just to own a pair. While the majority of ordinary consumers prefer sneakers that are comfortable, stylish, versatile, and have excellent value for money, some intentionally search for the rarest pair and most upscale iterations they could get their hands on no matter the price. A number of Adidas NMD sneakers have made it in the world's most expensive shoe list, here are some of them. Most of the sneakers that made this list were released in a limited number of pairs making its value higher. Prices listed are based on average resale costs. Pharrell Williams partnered with Chanel designers to put a high-end twist on famous Adidas NMD sneakers. It was released in a Chanel store in Colette to celebrate the end of the latter company's run in the retail business. The sneakers were made available in only 500 pairs and were auctioned off via a raffle for $1,160. Its limited nature made the demand so astounding that a court bailiff had to read the auction winners. After years of struggling to find stable ground, Adidas hit the jackpot with the releases of the Boost and Yeezy lines. Not long after, the brand introduced a hybrid of running and stylish everyday sneakers through the NMD range, which is just as successful. The price range of Adidas sneakers has been steadily growing to four and five-figures. One of these sneakers is the NMD_R1 ‘Friends and Family,' which has the same colorway as the OG NMD but with glitch camo detail in the upper. The shoe was released to consumers with official IDs only, but resellers have also made them available in a much higher price tag. Known for his hit records and stylishly unique outfits, it's not surprising that whatever merchandise the musician releases is always received with enthusiasm. Williams has been a long-time collaborator of Adidas and his work on the NMD is by far the most expensive. With GR versions usually selling in four-figure prices, this ‘Friends and Family' version is expectedly more costly. After almost seven years of being on hiatus, Pharrell Williams' group called N.E.R.D decided to get together and make music again. This sneaker was created to generate hype around the group's reconnection and was released during ComplexCon in Long Beach, California. It is, again, made available in limited amounts of pairs. This sneaker is designed in collaboration with a Berlin-based streetwear and sneaker store called Overkill. It is a limited edition release as only 300 pairs were manufactured and exclusively intended for friends and family as a gift. These circumstances made the Adidas NMD sneaker very hard to find. Designed with today’s modern sneaker in mind, Adidas NMD sneakers are generally streamlined, lightweight, and minimal with a sock-like upper construction. With this in consideration, it is no surprise that most of the NMD models are crafted from the brand’s latest knitting technology called the Primeknit. It provides a lightweight and ultra-breathable yet supportive fit, which most consumers found convenient and super comfortable. An example is the Adidas NMD_R2 Primeknit. Sneakers with an upper made from mesh are not quite as breathable and light as that of a Primeknit-crafted shoe, but this material provides more heat retention perfect for colder weather. Adidas NMD sneakers with a mesh upper retain the collection's signature of sock-like fit and slip-on function. Check out the Adidas NMD_R1 as an example of a kick with a mesh upper. Suede is a luxurious fabric that can instantly enhance any product's stylishness. For shoes with suede uppers, durability and a premium look are its obvious effects, but it could also affect the way a sneaker fits. Adidas NMD sneakers, in particular, are known for having a breathable and sock-like fit. However, models crafted with suede is reported to have more room than the traditional NMD kick. Moreover, due to its thicker material, NMD fans find suede-crafted NMD sneakers to be stiff and uncomfortable at first. This case is true with the Adidas NMD_C2. Rooted and inspired from some of the brand's vintage running models, Adidas NMD sneakers mostly feature a low-top construction. This allows for maximum ankle movement and lighter feel due to minimal use of materials. Generally, most sneakers are crafted with a low-top silhouette and are mostly preferred especially for casual everyday use. The popularity boom of Adidas NMD sneakers can be significantly contributed to its unique yet strangely familiar design. Having insight and understanding as to what the shoe's aesthetic inspiration is could help in grasping why it has done so well in a chaotic sneaker scene in a relatively short period. Here is some brief information about how the kick's design came to be. Introduced during the latter part of 2015, the Adidas NMD featured a slip-on style upper that's crafted from neoprene and mesh materials and sits atop a full-length Boost sole. According to Nic Galway, the NMD's designer said he had several goals in mind while designing the shoe. One of them is that he wanted to make this next sneaker recognizable even from far away. He also said it's about creating a design that can capture today's style, making it extremely wearable, and making sure that every detail has a function. He did this by leading his team in going back through the brand's archives to find inspiration. The team narrowed down the chosen archived sneakers to three progressive running styles from the 80s: the Micro Pacer, the Rising Star, and the Boston Super. The team then had to face the challenge of coming up with an utterly new-looking silhouette and had to be sure that they're not just copying. Rooted in being clean, wearable, comfortable, versatile, and stylish, Adidas created a novel sneaker that encompasses the best of the brand's past and future. With a lightweight, flexible, and compressible construction, Adidas NMD sneakers were designed for travelers who have a "nomadic lifestyle." The color blocks on the midsoles of some Adidas NMD sneakers aren't just homage to the Micro Pacer; they also provide support for the Boost sole and reinforcements to the shoe's upper. The NMD's Boost sole is made from blown TPU pellets that are compressed to build a responsive, durable, and shock-absorbing sole. Mastermind – A Japanese fashion label. The silhouette used was the Adidas NMD_XR1. Sneakersnstuff – An online sneaker and streetwear store based in Sweden. The two brands have released quite a few iterations of the NMD_CS1, NMD_R1 Primeknit, and the NMD_R2. Parley – An environmental group that focuses on threats towards the ocean. The two produced a bluish-green color of the Adidas NMD_CS1. United Arrows and Sons – A Japanese retail store, which have reinterpreted Adidas' NMD_CS1, NMD_CS2, and NMD_R2. A new NMD silhouette called the Adidas NMD_TS1 has recently been introduced. The first release was made in collaboration with Mita. The brand claims that they sold approximately 400,000 pairs of Adidas NMD sneakers during one of their initial releases. What does NMD stand for? The NMD is the name given to one of Adidas' newest sneaker styles, and it stands for nomad. It is a lifestyle sneaker that boasts of technology and design inspired by the sport of running. The shoe references design from the brand's progressive vintage shoes and combines it with new technology, specifically Primeknit and Boost technologies. Today, numerous variations of Adidas NMD sneakers been introduced and are one of the best-selling sneakers on the market. Who is responsible for the design of Adidas NMD sneakers? With a market overflowing with boundless sneaker designs being released every day, it takes something truly cutting edge to rise above all and get noticed. Adidas' NMD sneakers did just that. It is one of the very few original sneaker models that broke through today's oversaturated market, and the man responsible for this design is Nic Galway. 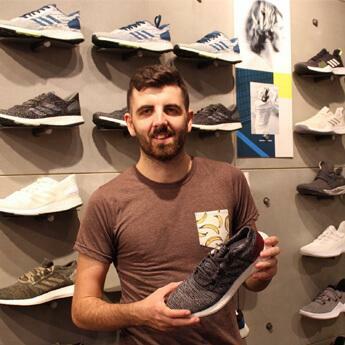 Nic Galway is the current Vice President for Adidas Originals' Global Design. He has experience and background in industrial and automotive design, which proved to be really helpful once he joined Adidas. Galway became a part of Adidas in 1999 and said that it was the time when sneaker collaborations were just starting. Hence he has witnessed the inception of what we know as the "sneaker scene" today. His credentials include working with Yohji Yamamoto, Stella McCartney, and Kanye West. He is also responsible for some of Adidas' most popular sneakers such as the Yeezy Boost 350, Pure Boost, and the Y-3 Qasa. Are Adidas NMD shoes for running? Most people assume or want to think that Adidas NMD sneakers could be used for running for two reasons: saving up money and convenience of "killing two birds with one stone" by using it as an everyday shoe and a running kick. Hate to break it to you, but these kicks are designed solely as a casual everyday pair. The NMD's construction is relatively light and is marketed as a pair that offers excellent cushioning, however, it lacks the support that's vital during the repetitive actions of running. The dynamic effect of running to your body causes a lot of strain and stress especially on your feet and legs, for this reason opting for a specially engineered shoe for the sport of running is best recommended to avoid injuries and accidents. What is special about Adidas NMD sneakers? Why are they so popular? Adidas NMD sneakers are so well-known that stocks would fly out the shelves as soon as they hit it. Initial releases also caused Supreme-like customer lines outside stores and even reselling costs are double the amount of standard retail prices. The NMD's popularity can be contributed to the shoe's perfect fusion of today's modern fashion sense with superb comfort. The shoe's design hit the bulls-eye when it came to finding the perfect balance of innovation, familiarity, and wearability. Moreover, its recognizable aesthetic had captured today's representation of stylish modern footwear, and this is what initially grabbed the consumer's attention. However, we all know that good looks could only last for quite some time especially in a world of constant shoe releases, so what kept consumers hooked on the Adidas NMD sneaker? This is where the technical stuff and marketing comes in. Thanks to a perfect mix of materials that offer excellent comfort and high-quality workmanship, and not to mention rare collaboration releases, consumers can't get enough of Adidas NMD sneakers. Where can I buy Adidas NMD casual sneakers? With a reputation known for selling out fast, being knowledgeable where to shop Adidas NMD sneakers might give you an advantage over people who are not paying attention. 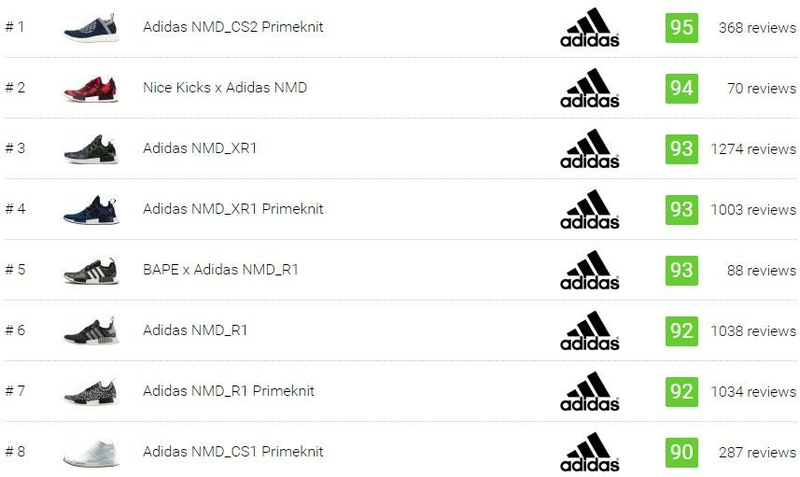 Here’s a list of official retail partners where you could cop your next NMD pair. This list does not include aftermarket sellers, and if you plan to purchase from these sellers keep in mind that it is more expensive and could be fake. How comfortable is the Adidas NMD? Generally speaking, consumers who have tried a pair of Adidas NMD sneakers found them very comfortable. Furthermore, the majority of people have agreed that the NMD is one of the most comfortable sneakers available in the market today. Equipped with the brand's Boost technology, most found the experience pleasurable. However, as mentioned earlier everyone's feet are different, and some might need more support after two hours of being on their feet while others might not feel the need to. In recent years Adidas has undoubtedly stepped their game up and became so successful that the brand had officially regained the number one spot for the biggest sportswear brand in the world. Some of the silhouettes that made their comeback possible (and rather explosive) are the Ultra Boost and the NMD. These two models are also some of Adidas' hottest selling sneakers on the market today. Consumers, due to its design resemblance and similarity in technologies applied, often compare the Adidas NMD and Ultra Boost. So, which one is better, you ask? Let's start by saying that the shoes' "sameness" ends with just resemblance and technology. The Adidas Ultra Boost is a performance running shoe, which also means that its materials are crafted to provide more support, stability, cushioning, and protection compared to a casual sneaker. On the other hand, the Adidas NMD is created as a casual lifestyle kick that leans more on the fashion side. Although, the NMD's comfort shouldn't be dismissed so quickly as it is one of the most comfortable casual sneakers out today. Plus, it is cheaper than the Ultra Boost. Ultimately, it all boils down to the individuals' personal preferences. If you are seeking for a pair that's adequately comfortable, stylish, and more affordable for every day, then Adidas NMD sneakers might be your best bet. But if you value comfort more and if you have the budget then opt for the Adidas Ultra Boost. Are there other products in the NMD collection other than footwear? Yes, there are. Adidas’ NMD range also offers accessories, such as bags and caps, and apparel too. But most of their merchandise are sneakers.